Research on the science and applications of carbon nanotubes (CNTs) will soon enter into its third decade. The initial flood of papers describing the extraordinary properties of CNTs has generated great excitement, promising technological breakthroughs in fields as diverse as nanoelectronics, bio-medicine and aerospace. Today the typical products containing nanotubes include, paint, vehicle parts, sports equipment, and similar applications in which CNTs are playing an auxiliary role by reinforcing bulk mechanical, thermal, or electrical properties. But any anticipated revolution in nanotechnology products and applications based on the unique one dimensional (1D) properties of CNTs has in fact been slow to materialize. The main reason most of the promising technology applications remain stuck on laboratory benches is the lack of reproducibility in the structure and the quality of the CNT samples available for application research. This non reproducibility is related to the ability of carbon to form a large variety of structures from the same number of carbon atoms just by changing the bonding configuration with itself. The number of such structures, referred to as isomers, increases nonlinearly with the number of carbon atoms. For example, the best known fullerene C60 has one isomer, while C120 has around 14,000. The large number of isomers leads to a non-uniform product distribution that can dramatically change in response to relatively small changes in experimental parameters that are often difficult or impossible to account for. This is why the various methods used for synthesis of CNTs produce such vastly different distributions of single wall and multi wall CNTs along with other carbon structures that are undesirable side products of the synthesis process. The applications of CNTs can be divided into two main categories. The first category includes various applications that use CNTs in a bulk form or in combination with other materials to enhance their bulk thermal, electrical, and mechanical properties. For these applications the primary concern is the availability of CNTs in large quantities. The second category of applications is based on exploiting the size dependent and quantum properties of individual CNTs. These applications include novel molecular scale electrical and mechanical devices and probes capable of interacting with single molecules. The most exciting device applications are based on the 1D electrical and optical properties of metallic and semiconducting CNTs. Many of the unique nanoscale properties of CNTs and other nanostructures do not have bulk equivalents. The capture of these properties into macro scale applications critically depends on the uniformity of the CNT properties. Carbon is the sixth element of the Periodic Table. The six electrons of carbon occupy the 1s2, 2s2, and 2p2 atomic orbitals, making carbon the first element in Group IV. 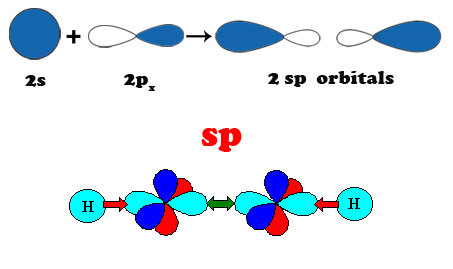 The 2s2 and 2p2 orbitals are close in energy resulting in atomic orbital configuration consisting of 2s, 2px, 2py, 2pz orbitals with wave functions that can readily mix with each other to optimize the bonding energy of carbon with its neighbors. 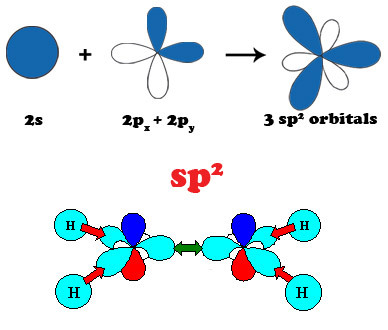 This intermixing of atomic orbitals gives rise to three new electronic configurations designated by sp3, sp2 and sp1 that are known as hybrid molecular orbitals. Hybridization determines the type of bonding of the carbon atoms with its neighbors. 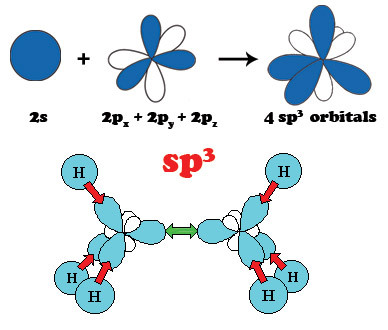 The sp3 hybridization corresponds to the well known tetrahedral configuration in which carbon binds to 4 neighbors giving rise to three-dimensional interconnectivity of carbon atoms that is found in diamond. The sp2 bonding in which carbon atoms bind to 3 neighbors also known as trigonal hybridization gives planar structures found in graphite and graphene. Diagonal or sp1 hybridization that gives linear molecules in which carbon binds to only 2 neighbors is found in polyyne chains. Conceptually CNTs can be obtained by wrapping a single sheet of graphite (graphene) into a seamless cylinder. 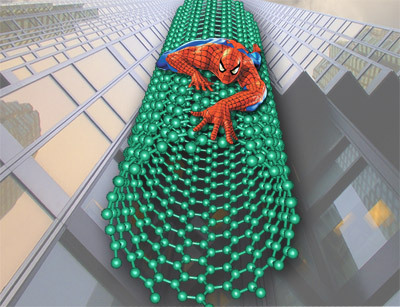 As such, they are dominated by the properties of the sp2 carbon that makes up the graphene sheets. In addition, small diameter CNTs exhibit quantum confinement effects characteristic of one-dimensional (1D) periodicity. The properties of CNTs are classified in terms of the symmetry of their atomic structure. The starting point of this structure is the honeycomb lattice that is described by two lattice translation vectors. The chiral vector of the CNT connecting two equivalent points of the honeycomb lattice is given as a linear combination of the two basis vectors designated by a pair of integers (n,m). A CNT in general is described by the diameter of the tube and the angle of the chiral vector that specifies how a graphene sheet is rolled-up into a CNT. Ideally this cylindrical structure is terminated at both ends by a pair of caps that when joined together form a fullerene. This description represents a convenient way to illustrate the range of CNT structures using the example of a CNT derived from a well known fullerene such as C60. The CNT is constructed by bisecting a C60 molecule at the equatorial line and using it to cap a cylindrical segment made from a wrapped graphene sheet that perfectly connects to the edges of the C60 caps. If the C60 molecule is bisected perpendicular to the five fold axis the "armchair" tube designated by (5,5) results, and if the C60 molecule is bisected normal to a three fold axis the "zigzag" tube designated by (9,0) is formed. These two characteristic CNT structures determine a range in chiral angles that spans 30o. Of course many other armchair and zigzag CNTs with larger diameters having larger fullerene caps can exist. In addition, a large number of chiral CNTs exists with a chiral angle in the range 0<|θ|>30o, with a screw axis along the CNT axis with matching fullerene caps. The properties of the CNTs are classified according to the mod 3 rule. All armchair (n=m) CNTs are metals at room temperature. CNTs with n-m=3j, (j=1,2,3...) are semi-metals. All other CNTs with n-m=3j+1, and n-m=3j+2 (j=0,1,2,3...) are semiconductors with a bandgap that is inversely proportional to the diameter [3-16]. The synthesis of CNTs is part black magic and part science. All current synthesis methods for CNT production evolved through trial and error. The general approach is to use some energetic source to create a high concentration of reactive carbon species that are allowed to equilibrate at some rate governed by the temperature of the background. In the process of thermalization the reactive carbon species assemble into carbon structures of increasing size that can form during the finite time period that the system spends while sweeping across the entire range of the energetic stability landscape. The three main synthesis methods include arc discharge, laser vaporization, and chemical vapor deposition (CVD). The elements of carbon reaction chemistry in these three methods are in principle similar. However, in practice the processes are different by the degree of the initial excitation that starts the nanotube growth process, and the intermediate stages that the reactions go through during approaching the final state. A direct consequence of the high temperatures in arc discharge and laser vaporization that are required to evaporate solid carbon is the formation of a large variety of other carbon structures in the final product along with single wall CNTs (SWNTs). In addition, it was found that addition of a small amount (1%) of transition metal (Fe, Co, Ni) was necessary to obtain SWNTs. The typical byproducts of these methods include a large amount of fullerenes, a variety of graphitic structures, amorphous carbon in a form of particles or coating on the walls of the CNTs. The main drawback of both arc discharge and laser vaporization is that a purification process must be performed to extract the SWCNTs. In addition to being labor intensive the acids and harsh chemicals used in purification along with removing the side products often attack and damage the CNTs. The purification step results in a significant loss of the SWCNT material often combined with irreversible changes of the intrinsic CNT properties. The main reason the synthesis process is poorly controllable is the harsh reaction environments currently used in CNT production which are clearly not suitable for solving the quality and reproducibility problems. There are numerous examples in organic and polymer chemistry, which demonstrate that carbon-carbon bond formation occurs and can be controlled in mild reaction environments. The added advantage of this approach is that it can render unnecessary the extensive and laborious post growth processing steps that are currently the only way for accessing the unique properties of CNTs. Content of the web page has been developed by Gyula Eres, a senior research staff member in the Materials Science and Technology Division of Oak Ridge National Laboratory. 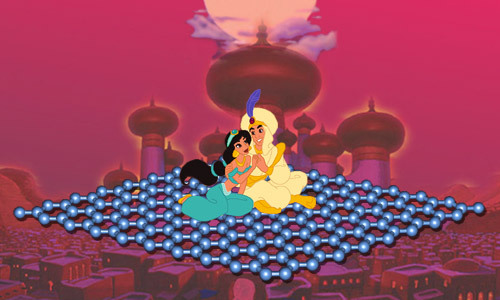 The characters of the pictures are taken from Walt Disney' s "Aladdin" and Marvel's "Spiderman". Who should be given the credit for the discovery of carbon nanotubes? M. Monthioux, V. Kuznetsov, Carbon 44: 1621 (2006). Helical microtubules of graphitic carbon S. Iijima, Nature 354: 56–58 (1991). Where nano is going D. J. Palmer, Nanotoday 3, 46 (2008). 18] Carbon Nanotube – the Route Toward Applications, R. H. Baughman, A.A. Zakhidov, W.A. de Heer, Science 297, 787 (2002). Carbon allotropes: a suggested classification scheme based on valence orbital hybridization, R.B. Heimann, S.E. Evsyukov, and Y. Koga, Carbon 35, 1654 (1997). Topological and sp3 defect structures in nanotubes, T. W. Ebbesen and T. Takada, Carbon 33, 973 (1995). Large scale CVD synthesis of single-walled carbon nanotubes, A.M. Cassel, J.A. Raymakers, J. Kong, H.J. Dai J. Phys. Chem. B 103, 6484 (1999). Formation of Filamentous Carbon, R.T.K. Baker and P.S. Harris, in Chemistry and Physics of Carbon, vol.14, p. 83 (Marcel Dekker, 1978). Molecular beam-controlled nucleation and growth of vertically aligned single-wall carbon nanotube arrays, G. Eres, A.A. Kinkhabwala, H.T. Cui, D.B. Geohegan, A.A. Puretzky, D.H. Lowndes, J. Phys. Chem. B 109, 16684 (2005). Investigations of single-wall carbon nanotube growth by time-restricted laser vaporization A.A. Puretzky, H. Schittenhelm, X. Fan, M.J. Lance, L.F. Allard, Jr., and D.B. Geohegan Phys. Rev. B 65, 245425 (2002). In situ measurements and modeling of carbon nanotube array growth kinetics during chemical vapor deposition, A.A. Puretzky, D.B. Geohegan, S. Jesse, I.N. Ivanov, G. Eres, Appl. Phys. Materials Science and Processing 81, 223 (2005). Water-assisted highly efficient synthesis of impurity-free single-walled carbon nanotubes, K. Hata, D.N. Futaba, K. Mizuno, T. Namai, M. Yumura, and S. Iijima, Science 306, 1362 (2004). Real-time imaging of vertically aligned carbon nanotube array growth kinetics, A.A. Puretzky, G. Eres, C.M. Rouleau, I.N. Ivanov, and D.B. Geohegan, Nanotechnology 19, 055605 (2008). Collective Mechanism for the Evolution and Self-Termination of Vertically Aligned Carbon Nanotube Growth, M. Bedewy, E.R. Meshot, H.C. Guo, E.A. Verploegen, W. Lu, and A.J. Hart, J. Phys. Chem. C 113, 20576 (2009). Model for Self-Assembly of Carbon Nanotubes from Acetylene Based on Real-Time Studies of Vertically Aligned Growth Kinetics, G. Eres, C.M. Rouleau, M. Yoon, A.A. Puretzky, J. Jackson, and D.B. Geohegan, J. Phys. Chem. C 113, 15484 (2009). Single-walled carbon nanotube growth with non-iron-group "catalysts" by chemical vapor deposition, Y. Homma, H. Liu, D. Takagi and Y. Kobayashi, Nano Res. 2, 793 (2009). Order in vertically aligned carbon nanotube arrays ,H. Wang, Z. Xu, G. Eres, Appl. Phys. Lett. 88, 213111 (2006). The Chemistry of Water on Alumina Surfaces: Reaction Dynamics from First Principles , K.C. Hass, W. F. Schneider, A. Curioni, W. Andreoni , Science 282, 265 (1998). Millimeter-thick single-walled carbon nanotube forests: Hidden role of catalyst support, S. Noda, K. Hasegawa, H. Sugime, K. Kakehi, Z.Y. Zhang, S. Maruyama, Y. Yamaguchi, Jap. J. Appl. Phys. Part 2 46, L399 (2007). Role of Water in Super Growth of Single-Walled Carbon Nanotube Carpets, P.B. Amama, C.L. Pint, L.McJilton, S.M. Kim, E.A. Stach, P.T. Murray, R.H. Hauge and B. Maruyama, Nano Lett. 9, 44 (2009). Self-sorted, aligned nanotube networks for thin-film transistors, M.C. LeMieux, M. Roberts, S. Barman, Y.W. Jin, J.M. Kim, and Z. Bao, Science 321, 101 (2008). Charge Transport in Interpenetrating Networks of Semiconducting and Metallic Carbon Nanotubes, M.A. Topinka, M.W. Rowell, D. Goldhaber-Gordon, M.D. McGehee, D.S. Hecht, and G. Gruner, Nano Lett. 9, 1866 (2009). 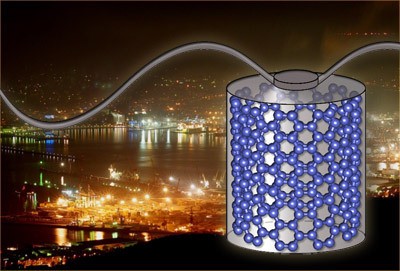 Horizontally Aligned Single-Walled Carbon Nanotube on Quartz from a Large Variety of Metal Catalysts, D. Yuan, L. Ding, H. Chu, Y. Feng, T.P. McNicholas, and J. Liu , Nano Lett. 8, 2576 (2008). Progress towards monodisperse single-walled carbon nanotubes, M.C. Hersam , Nature Nanotechnology 3, 387 (2008). Dislocation theory of chirality-controlled nanotube growth, F. Ding, A.R. Harutyunyan,b and B.I. Yakobson , PNAS 106, 2506 (2009). Preferential Growth of Single-Walled Carbon Nanotubes with Metallic Conductivity, A.R. Harutyunyan, G. Chen, T.M. Paronyan, E.M. Pigos, O.A. Kuznetsov, K. Hewaparakrama, S.M. Kim, D. Zakharov, E.A. Stach, G.U. Sumanasekera , Science 326, 116 (2009). Narrow (n,m)-Distribution of Single-Walled Carbon Nanotubes Grown Using a Solid Supported Catalyst, S.M. Bachilo, L. Balzano, J.E. Herrera, F. Pompeo, D.E. Resasco, and R. B. Weisman , J. Am. Chem. Soc. 125, 11186 (2003). Single Wall Carbon Nanotube Amplification: En Route to a Type-Specific Growth Mechanism, R.E. Smalley, Y. Li, V.C. Moore, B. K. Price, R. Colorado, Jr., H.K. Schmidt, R.H. Hauge, A.R. Barron, and J.M. Tour , J. Am. Chem. Soc. 128, 15824 (2006). Continued Growth of Single-Walled Carbon Nanotubes, Y. Wang, M.J. Kim, H. Shan, C. Kittrell, H. Fan, L.M. Ericson, W.-F. Hwang, S. Arepalli, R.H. Hauge, and R.E. Smalley, Nano Lett. 5, 997 (2005). "Cloning" of Single-Walled Carbon Nanotubes via Open-End Growth Mechanism", Y. Yao, C. Feng, J. Zhang, and Z. Liu , Nano Lett. 9, 1673 (2008). Synthetic Approaches toward Molecular and Polymeric Carbon Allotropes, F. Diederich and Y. Rubin , Angew. Chem. Int. Ed. 31, 1101 (1992).